Turn that box of old video tapes or camcorder tapes that's sitting in your closet or basement into digital format! 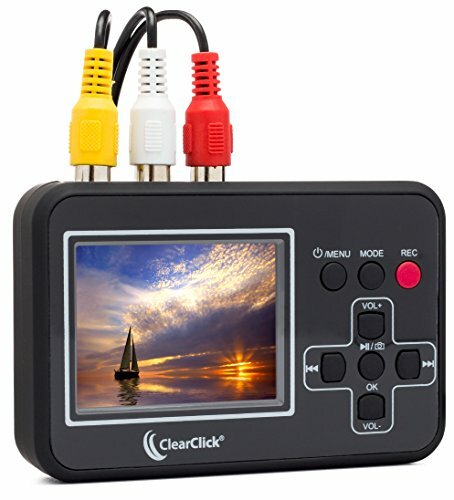 With the ClearClick Video To Digital Converter, you can transfer your videos to digital format with the touch of a button. Convert your VHS collection and enjoy your old movies again. Restore and share your family memories from 20 years ago. You can watch your digitalized videos on your computer, tablet, smartphone, or your TV. 3) Press "Record" again to stop recording (see important note below). 4) Transfer your digitalized videos to your computer with the included USB cable. Then put them on your smartphone, tablet, or burn a DVD. With the included Prism Plus Video Converter software, you can convert your digitalized videos into smartphone and tablet friendly formats. You can also compress your videos, so that you can share them online and through email. Compatible with both Windows & Macintosh computers. This device also comes with ClearClick's free USA-based tech support and full 1-year warranty. Prism is published by and is a trademark of NCH Software, Inc. Used with permission. IMPORTANT AUDIO/VIDEO SYNC NOTE (July 2016): Each recording must be manually stopped at 2 hours or less. Otherwise, the resulting video will have out of sync/delayed audio. If you have any questions about this product by ClearClick, contact us by completing and submitting the form below. If you are looking for a specif part number, please include it with your message.